Wahoo! Pop some bubbly and savor this milestone moment. You’ve been dreaming of your fresh look and watching it all come together for awhile now, but there’s something special about unveiling the new face of your brand to the whole world. Sharing your anticipation about your brand’s growth is exciting, and tons of fun! It’s also a monumental opportunity to drive potential new clients to your site. Make the most of Launch Day by building anticipation, showing your new design in its best light, and sharing your brand’s milestone wherever you can. Here are our top ten tips to help you take advantage of Launch Day. Now go for it! Don’t reveal the true launch date. Give yourself some wiggle room to work out all the kinks and get used to your new design. Count down to a Launch Day that’s actually a few days after your site has been up and running. That way, you can be sure everything is in tip top shape when the site traffic comes pouring in. Prepare “launch graphics” to post with your new look. You want to show your brand in its best light on Launch Day. Make your brand elements look ten times better by thinking about how you want to display them. Do a mini photoshoot in natural light to get pretty styled photos of print pieces, and consider taking a styled photo of your site on your computer, tablet, and phone. These will look way better than digital files or screenshots, and add a professional touch to your launch post. Need styling tips? Grab your iPhone and check out our post on easy styled photoshoots. Talk to others about sharing your site. Believe it or not, there are other people who are just as eager to share your brand as you are! Hint hint: we have an awesome spotlight feature on our blog—with just a quick email, we can feature your interview along with your new brand. This combines your followers with our followers… a win-win situation! Look into blogs and relevant sites that would also be happy to exchange features, adding new followers into your mix. Hashtag, hashtag, hashtag! This is the time to go crazy with the #s! You’ll be able to tag your post with relevant keywords that allow new followers to find your brand online. Instagram is the perfect visual medium for showing off pretty images hashtagged with important keywords. Mass email. This is an easy way to reach tons of people who care about your brand and its recent milestone. Collect all of your email addresses and send a Launch Day email to everyone you know! Friends, family, and clients will love getting this personalized update in their inbox. Mail Chimp is a free service that lets you easily out your email to up to 2000 names—the more, the merrier. Pin your own images! Pinterest is another stellar visual medium for sharing photos and driving traffic back to your site. Make sure you pin all the images of your new brand, with relevant descriptions (and don’t forget to refer back to item 5). You can also use Pinterest Analytics to see how users interact with your pins (see our post on that right here). Re-share, and re-share again. 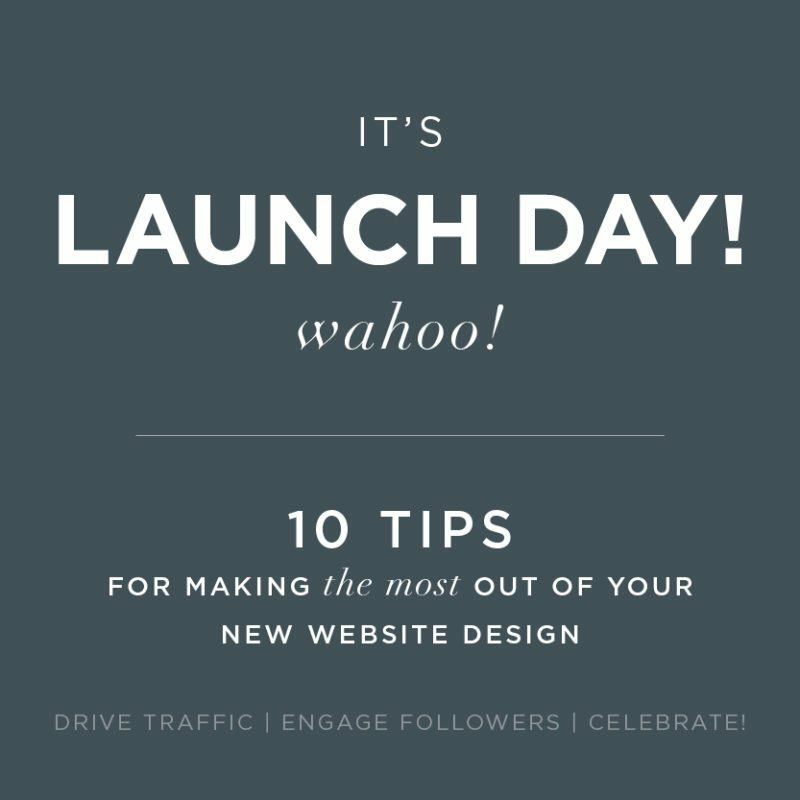 Launch Day is the culmination of a lot of dreaming and hard work, but your site and brand elements need to function long after the big reveal. Keep visitors coming back to your site by re-sharing content a few days later with a new twist. Save a few photos for this “re-share phase” so you can highlight features of your design with fresh images. Tell the world why your look is still awesome, whether you just made a statement with letterpressed business cards or you’re in love with the gallery layout on your new site. Make it personal. This is the most important part of Launch Day! You’ve been eagerly anticipating this moment of brand growth for awhile. You deserve to share it and all the thoughtful considerations behind it with the world. Tell everyone personal details—why your site perfectly expresses you! Congratulations on your Launch Day! We’re so excited for you… and with these tips, your followers will be too!